← Reminder..Some Nice Cards Ending Today! Some New WonderGround cards etc. I am on an extended trip in the Southern California area this week. Tonight I decided to drop by Downtown Disney to see what was going on. For the week after Thanksgiving, the place was remarkably crowded. I am not sure if it was mostly locals or what….but it was really rather crowded between 7PM and 8PM tonight. A quick stop into WonderGround netted a few new cards. I have always had a soft spot for the Jungle Book, so I was happy to see this card of Ka, the wily python, for sale in the store. 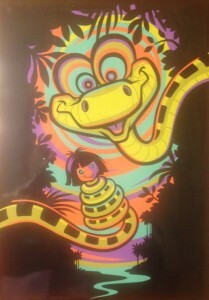 The work is titled, “Charmed I’m SSSSSSure” and is by Jeff Granito. Growing up I must have listened to the LP soundtrack of this movie a hundred times if I listened to it once. It is just loaded with great lyrics, music and talent! I then went into the Grand Californian to hang out in the lobby for a little bit. 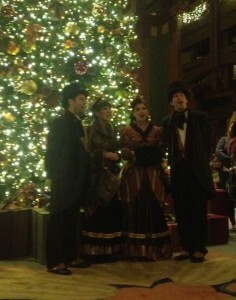 While there I had the good fortune to hear the “Disneyland Dickens Singers”. They were really good and sang a bunch of traditional Christmas Carols as well as some more modern stuff. They did a fantastic version of “Mary, Did You Know?”, as well as a perfect rendition of “Carol of the Bells”. If you live in the area you should check them out. They perform right in front of the big Christmas tree in the Grand Californian lobby. Tonight they were on at 7:30 and 8:30. I have a number of other things I wanted to talk about regarding some really interesting eBay lots, but I think I will save that for next time. I’m a little too tired to continue right now! This entry was posted in Disney Postcards, WonderGround and tagged Jungle Book. Bookmark the permalink. One Response to Some New WonderGround cards etc. Downtown Disney is always busy, especially at the holidays. Aren’t those singers the best? Their voices are beautiful!